It’s been at least a year since I’ve seen a new portable Bluetooth speaker that wasn’t some half-hearted rehash of the millions that came before. But this little B&O number—it’s something. Bluetooth speakers began with the Jambox, a concept so impossibly simple that of course a dorky headset manufacturer came up with it instead of some storied audio component company. A speaker that you could easily connect to wirelessly to play music off your phone. Duh. It was a concept so simple, so successful, and so easy to replicate, in fact, that today the market is flooded with speakers from brands you know, as well as from opportunistic upstarts you don’t. Basically everything new out there is insufferably boring. There are some great options—I’ve tried a ton of these things—but the rest is junk you shouldn’t give a second look. The Beoplay A1 comes from Danish luxury brand Bang & Olufsen’s more affordable B&O lifestyle brand, and though its $250 price tag is more expensive than anything we’ve ever recommended in the category, it’s not outrageously priced for a company whose stuff can easily cost thousands. More importantly, it’s very good looking. Its polished aluminum design and sturdy base make it a refreshing departure from the plastic-and-cloth numbers that dominate. It looks more like it came from a fancy design store than from the “last-minutes gifts” round-up on your favorite gadget blog, Gizmodo. The A1 sports a flat tabletop design, which projects sound out from drivers inside. 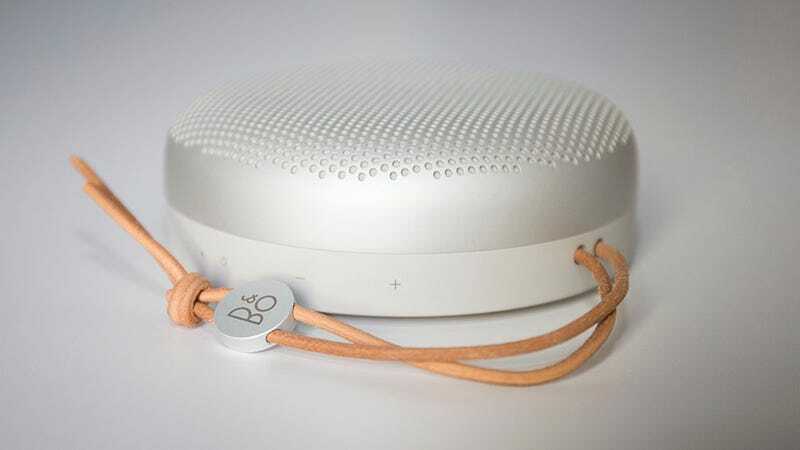 B&O claims it’ll fill a room with 360-degrees of sound, and that its battery will keep the tunes pumping for 24 hours. We’ll see! Indeed, you’re probably asking yourself, how does it sound? We haven’t put it through the paces yet. B&O makes good kit, so I’m optimistic, but on the other hand, for $250 it better sound outstanding. We’ll get back to you with more notes soon. If anything, the A1 is a recognition that little Bluetooth speakers you can carry around the house make a lot of sense, even for people who have the cash for more expensive gear. And even if $250 is out of reach for you, we can at least hope that more companies will start making handsome and convenient speakers that look less like junky gadgets.